Some years ago a disaster happened. I think it was a biggest world mud disaster. Lapindo Mud as a natural mud disaster For years catastrophe in drilling oil wells in Sidoarjo, East Java. Originally an attempt to improve the yield of oil, drilling companies were eager to find and explore earth added in East Java. Unfortunately, however, instead of oil or gas obtained but mud that out. In fact, unfortunately, the mud continues to gush out continuously incapable corked. As a result, vast plains in the Sidoarjo area turned into a sea of mud. Local people suffer and lose the house, and his hometown. Various parties involved expression and argument, as well as the experts expressed their opinions and thoughts One of the expert opinion is geodynamics of Germany. 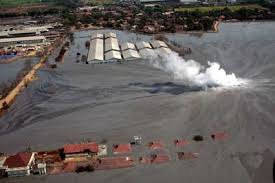 University of Bonn Germany geodynamic expert, Professor Stephen Miller considered that the Sidoarjo mudflow that occurred 8 years ago was a purely natural disaster. He believes the overflow of sludge caused an earthquake measuring 6.3 on the Richter scale that occurred 2 days earlier in Yogyakarta. "This mud is a natural cause, not because of non-scientific factors Lapindo Brantas. Read only study in the Journal," Miller said in Jakarta .. He explained that, although the incidence of both distance events of 250 kilometers, but the shape and structure of the rock formations in Sidoarjo has characteristics that amplify and focus the lens of seismic waves from the earthquake. Then dilute the turmoil energy sources and poured mud into a fault which is connected with hydrothermal systems. The results of Miller's research was said to have answered questions about the causal mud that had surfaced, especially in 2011, because until now no one has been able to argue that the research results from the scientific community. Miller also stated, at the time the mud must stop. This is because a variety of factors that show no longer a source of mud for ever. "It should not be a terrible scourge that continues. Sidoarjo mud disaster is a brand new tectonic system," he said. In addition, according to Miller, mud low area can be used as a source of new energy in Indonesia, volcano hydro energy, and clean energy, including being the tourism sector. Especially for the tourism sector, an area of mud could be 'the beauty of mud which gives tourist attraction in the country and abroad. When asked by the research linkages in Indonesian politics, Miller said, his research was not at all associated with particular political interests. He asserted that his research purely for the sake of science that can be tested and accounted for. "I do not understand Indonesian politics. Sure this natural biggest world disaster should not be linked to political issues," said Miller. Similarly, various opinions, In the end the people affected are expected to be patient and resignation as the government and the parties involved have gone to great lengths to reduce the impact of disasters the government and the parties involved and also has shown favor to the people who suffer. Hopefully this mud disaster and suffering to an end in short time with happy for all.